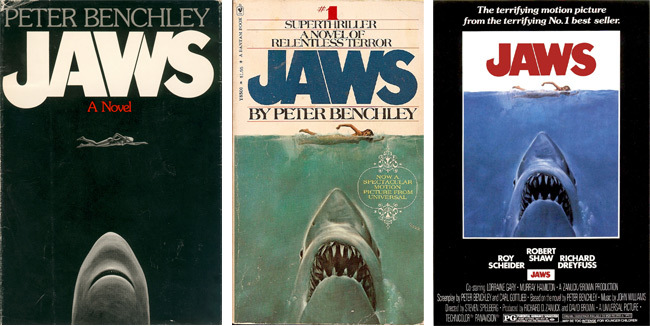 The first pages of Peter Benchley’s 1974 novel, “Jaws,” as well as the opening minutes of Steven Spielberg’s 1975 blockbuster, begin with the attack of a young, late-night skinny dipper named Chrissie Watkins, who’s dragged to her watery doom by a great white shark, feeding in the waters off the seaside vacation town of Amity. The book and film struck a chord, in no small part because they capitalized on our fear of the unknown—in this case, of being chomped to death by untold rows of unseen teeth. Depicting that fear, or at least the very moment before it, was a key part of the book’s and film’s marketing. Paul Bacon, one of the foremost book illustrators of the 20th century, created the original black-and-white image for the Doubleday hardcover (above, left). But the artist credited with creating the quintessential “Jaws” image is Roger Kastel, who became famous in the 1970s for his movie posters, including “The Empire Strikes Back.” Kastel produced the oil-on-board painting that became the cover of the Bantam paperback (above, center) and the Universal Studios “Jaws” poster that followed (above, right). Like any good thriller, the story of how Kastel’s painting journeyed from his New York studio to Hollywood is riddled with twists, turns, and blind alleys. As for its ending, Kastel’s tale still doesn’t have one—the whereabouts of his valuable original art have been a mystery since it was sent to Universal almost 40 years ago. 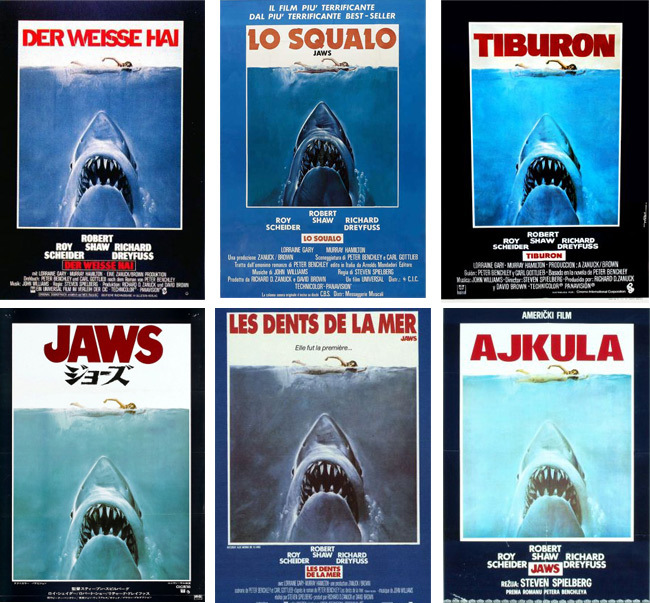 Although the title of the “Jaws” movie poster has been translated into numerous languages, the proximity of swimmer to shark needs no interpretation. Though the cover concept was born in Doubleday’s New York City offices in 1974, it was not the publisher’s first instinct for Benchley’s novel. Instead, Doubleday’s design director, Alex Gottfried, asked book illustrator Wendell Minor to depict Amity as seen through the jaws of a shark. In fact, the concept did not work at all, and the Doubleday executives knew it. They also knew the book was going to be huge—Hollywood producers were already fighting over the film rights, so they wanted to get it right. Gottfried called Minor for a makeover, but Minor was out of town, so the design director turned to Paul Bacon, a trusted publishing hand who Minor had apprenticed for, to execute a totally new concept. 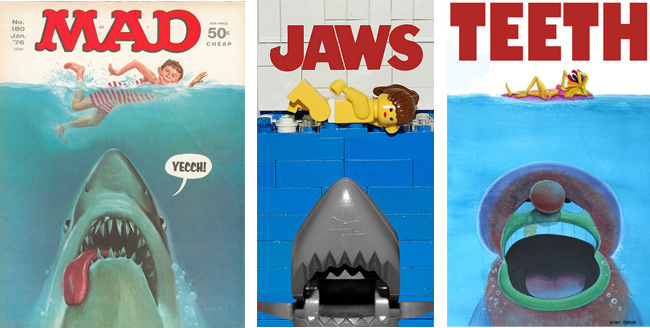 Roger Kastel’s “Jaws” image has been a rich source of good-natured parody. It caught the attention of Universal, too. “Apparently Universal had tried other poster ideas, but in the end they picked mine. They changed the color of the ‘JAWS’ lettering, added the actor names and other credits, and blurred the girl’s breasts with some foam.” Upon its release, “Jaws” immediately became the biggest movie of all time (replaced a few years later by “Star Wars”), making Kastel’s image world famous. 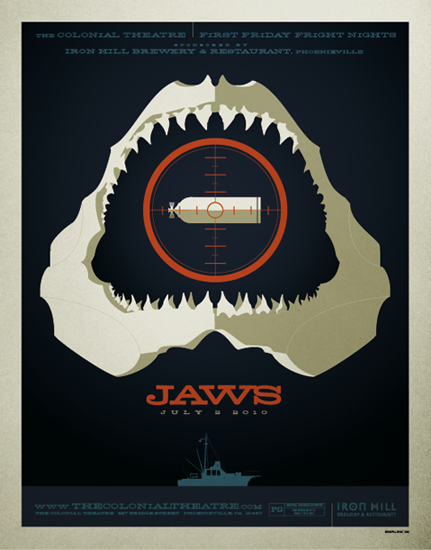 Some “Jaws” fans have complained that Tom Whalen’s poster for a 2010 screening contains a spoiler, but, as the artist puts it, who doesn’t know how “Jaws” ends? Source aside, it was Kastel’s execution that made the image an instant icon. “I think Kastel’s poster, like much of the best poster art of its era, tells the movie’s story instantly while making you want to learn more,” says Tom Whalen, who has made numerous second-generation, or tribute, movie posters for an Austin, Texas, publisher called Mondo. Whalen also gives props to the unnamed graphic artists at Universal who placed Kastel’s image amid the typography required to promote a movie. “The cool blue water situated opposite the blood red title just seals the deal,” he says. Print Mafia’s poster for Mondo is as toothy as Kastel’s original, but here it’s the movie’s title that’s getting chomped. Great story….dealing a great piece of pop art. If someone puts it on ebay they must be pretty stupid. They’ll be arrested for theft! 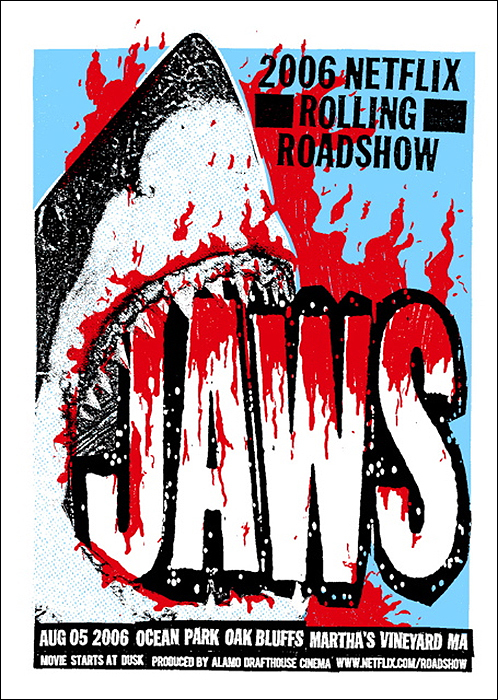 I don’t see the point stealing something like the Jaws poster. It’s such a famous piece of art that you won’t be able to ever show it to anyone through fear of having the police knocking on their door. That original painting is worth well over 100k make no mistake. When I was dating a girl in my twenties (roughly 23 yrs ago), we went to one of her friends houses and on his wall was a picture of the jaws poster. Her friend told us it was the original. That his father had drew the picture. I remember feeling honored to be able to see the original in its frame. Now that I know the original is lost maybe this guy still has it. Also depending on whether or not it really was the original. “ ” People like Gustav Stickley had a vested interest in promoting embroidery.